This is a pair of Masher 3.8” Monster Truck Tires. 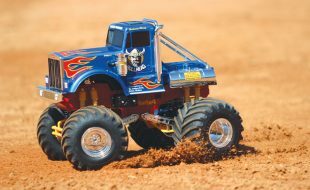 Pro-Line is bringing back one of the most popular Monster Truck Tires of all-Time: The Masher! The ultra-modern and edgy Chevron Style tread digs deep into the roughest and toughest terrain and looks mean doing it. The side tread of this behemoth tire features a hook shape that craters the dirt and achieves awesome side traction. 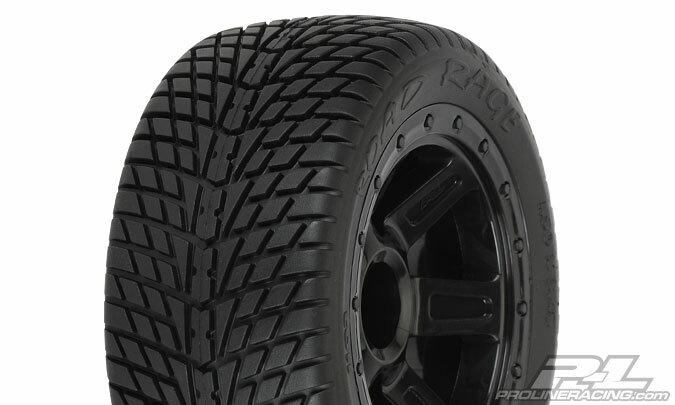 The Masher 3.8” tire features the new Traxxas Style Bead design giving you tons of wheel options. The tire will fit on any of Pro-Line’s 3.8” Traxxas Style Bead wheels, as well as any stock 3.8” Traxxas wheel! After fitting your truck with this massive Masher tread you’ll be ready for back yard thrashing and mashing on any neighborhood terrain. Impress your friends – Get a set of Mashers today! This is a pair of Square Fuzzie Short Course Tires. 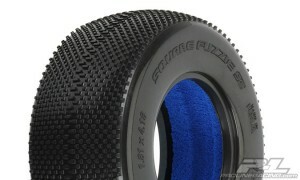 Pro-Line is bringing back one of the most successful and iconic tread patterns of all time; the World Champion Square Fuzzie. The original Square Fuzzie was so advanced for its time that it dominated the race tracks for many years and was never duplicated. Now, Pro-Line is proud to introduce the all new and improved Square Fuzzie for your Short Course Truck! The new Square Fuzzie tires feature countless square micro-pins laid out in a traction inducing grid pattern that will stick to the track like Velcro. The long center bars provide tons of forward bite and improved wear over the Original. 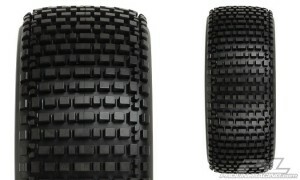 These tires are ideal for any indoor/outdoor hard-packed dirt track where bar-type tires are not getting the job done. The new Square Fuzzies will give you the confidence inspiring forward and side bite to propel you to the front! Don’t just take our word for it, get the new Square Fuzzies now and be the first to dominate your track with Pro-Line’s proven micro-pin technology! 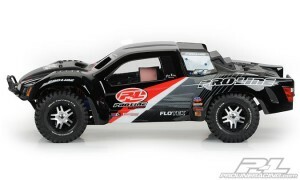 This is a Flo-Tek Clear Body for the Slayer Pro Nitro Short Course Truck. Pro-Line is proud to release the meanest looking and best-selling body ever created designed specifically for your Traxxas Slayer Pro: the Flo-Tek. The Flo-Tek was the first SC body specifically designed to minimize the short-course body parachute effect! If you have ever raced or bashed a short-course truck, you know that SC bodies act like parachutes when going over jumps, causing you to lose control and crash. Pro-Line’s new Flo-Tek SC body features futuristic styling coupled with large vent holes that allow air to flow through eliminating aerodynamic drag. The locations and size of the vents were designed to maximize air flow through the body while keeping the aggressive and high-tech look. 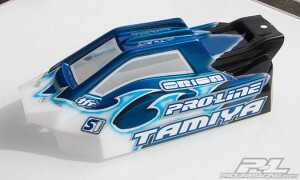 Don’t get caught in the wind while the competition passes you by, Get Pro-Line’s new Flo-Tek SC body today! 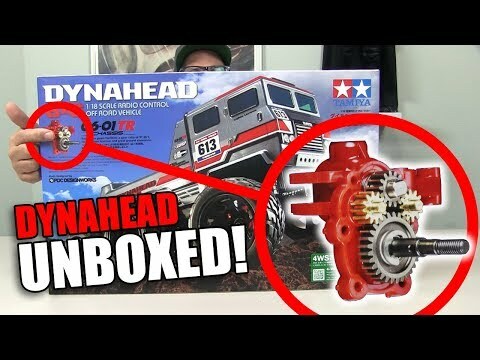 This is a BullDog Clear Body for the Tamiya TRF502X Buggy. Bodies have an undeniable effect on handling and performance. 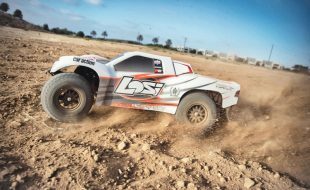 For 2012, Pro-Line has improved upon the BullDog design and developed the most advanced body yet: the 2012 BullDog body now for the Tamiya TRF502X Buggy. Pro-Line took great care in refining the design for 2012 to create even more stability with enhanced steering to gain an advantage on the track. The windshield is steeper to create more down force over the front wheels and the roof ridges have been raised to channel the air flow over the middle of the body for increased high-speed stability. The rear of the roof has been lowered and fins have been added to achieve stable air flow over the body. The fins also add rigidity to the body to increase aerodynamic efficiency. 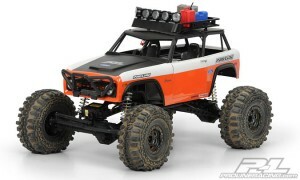 This is a must have TRF502X body for the new racing season! 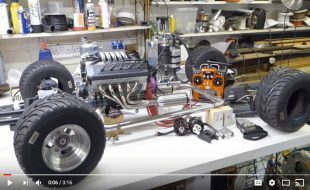 This is a 1973 Ford Bronco clear body for the Axial Wraith Chassis. 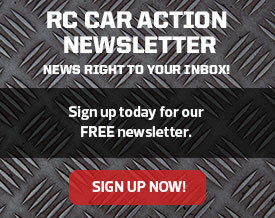 Attention all Wraith fans: Pro-Line has a brand new body for you – A 1973 Ford Bronco! The Bronco is known for its off-road capabilities and unique looks and now you can match that styling on your Wraith. 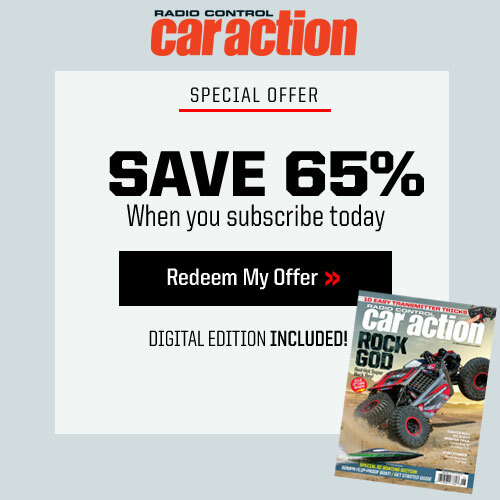 Complete with detailed grill, headlights, body molding trim, and that overall distinct Bronco look, all you classic truck enthusiasts will not want to be left behind. The body features separate molded doors giving you the option to run your Bronco with doors or without. Just like on a full-size crawler, the no door option exposes the frame! This is a truly customizable body that will please any Wraith owner. Get yours today! This is a pair of 1:5 scale Blockade XTR No Foam Tires. After countless hours of designing, building and testing, Pro-Line is ready to unleash the all-new Blockade tire for your 1:5 scale Short Course Truck. 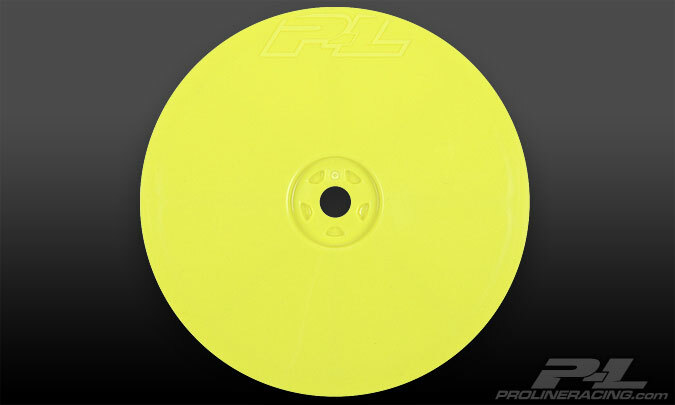 From the beginning, the Blockade was designed to be the ultimate race tire for any track condition. The Blockade features large, perfectly spaced lugs that rip into the dirt for incredible traction and has plenty of meat to last through super long race sessions. For super loose conditions, the Blockade tire can be tuned for more aggressive traction by trimming out alternating knobs. The inside of the Blockade contains unbelievably detailed webbing that strengthens the tire carcass and prevents excessive tire expansion. 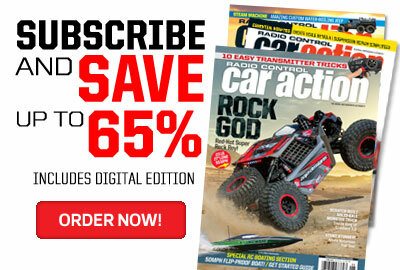 If you own a Baja 5SC or Losi 5ive-T, then you need a set of Pro-Line Blockades! This is a pair of Dirt Hawg I Off-Road Tires Mounted on Desperado 2.2” Black Wheels for 1:16 E-REVO. Looking for more stability and traction without added strain on your drivetrain? The Dirt Hawg’s mounted on Desperado 2.2” wheels give you just that all in a lightweight package. Stability is achieved by a ½” wider stance on each side of the vehicle with the new Desperado wheels. To complete the package, Dirt Hawg’s bring the element of control, agility and overall performance to your little E-REVO® with Pro-Line proprietary all-terrain design and high performance M2 (Medium) rubber compound. Pro-Line’s highly anticipated new 6-spoke Desperado wheel will make your truck the toughest looking one on the block. The wheel is a lightweight one-piece glue wheel made out of extremely durable nylon material and features a molded in bead-loc ring for an awesome scale look. 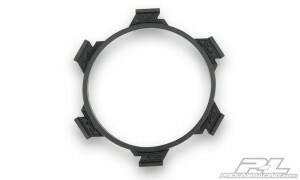 This is a 12mm hex wheel. Make your truck stand out from the rest and get some Dirt Hawg Tires Mounted on Pro-Line Desperado 2.2” wheels today! This is a pair of Road Rage Tires Mounted on Desperado 2.2” Black Wheels for 1:16 E-REVO. Looking for more stability and traction on the street without added strain on your drivetrain? 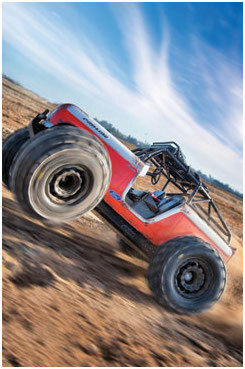 The Road Rage tires mounted on Desperado 2.2” wheels give you just that all in a lightweight package. Stability is achieved by a ½” wider stance on each side of the vehicle with the new Desperado wheels. To complete the package, Road Rage’s bring the element of control, agility and overall performance to your little E-REVO® with Pro-Line proprietary street-shredding design and high performance M2 (Medium) rubber compound. Pro-Line’s highly anticipated new 6-spoke Desperado wheel will make your truck the toughest looking one on the block. The wheel is a lightweight one-piece glue wheel made out of extremely durable nylon material and features a molded in bead-loc ring for an awesome scale look. This is a 12mm hex wheel. 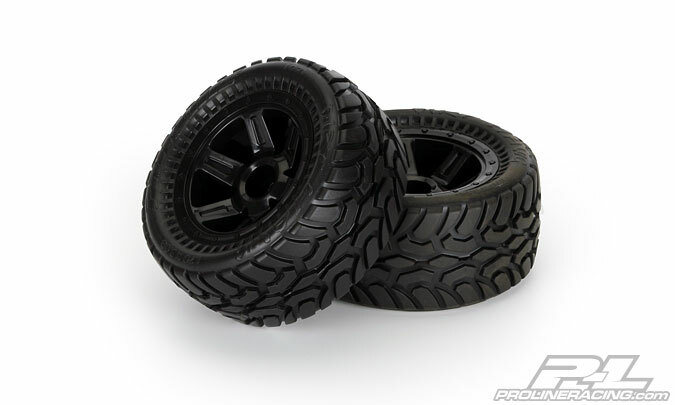 Make your truck stand out from the rest and get some Road Rage Tires Mounted on Pro-Line Desperado 2.2” wheels today! This is a pair of Velocity 2.2” 4WD Front Wheels for the Team Associated B44.1. 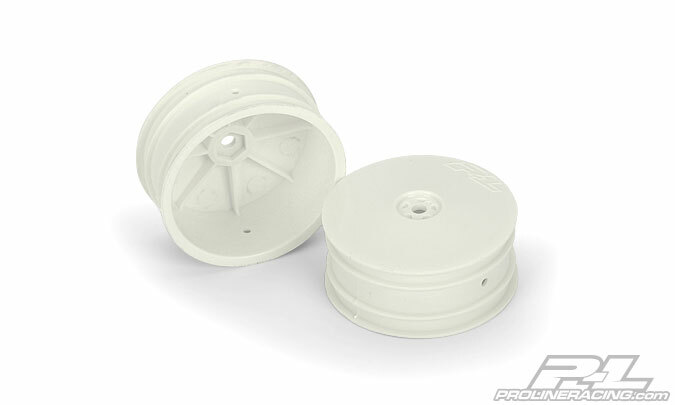 Pro-Line has you covered with lightweight and durable front racing wheels for the B44.1 buggy. 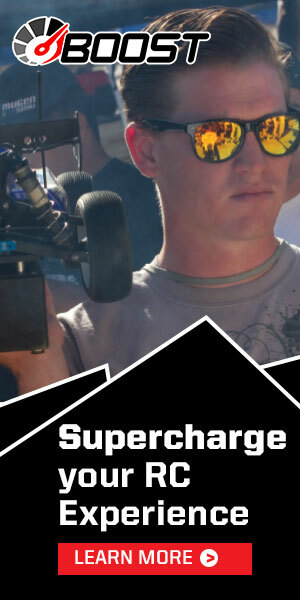 The wheels feature the latest in style and performance that will make your buggy look good racing around the track. A reversed dish design protects the nut and axle from damage during collisions and brings an awesome new look to your buggy. Pro-Line’s new wheels are ready to take your buggy to the front of the pack, so order some today! This is a Pro-Line Tire Bag. Show up to the races in Style with Pro-Line’s new tire bag! The new bag features luggage quality zippers and material that displays your support with a huge P-L logo. The bag is supported by an inner corrugated plastic housing that protects your stuff and holds the bags shape. This multi-purpose bag will hold a bunch of tires, tools, chargers, batteries or basically anything you need to take you to the track, all while still being small enough to easily fit in the trunk of your car. Pro-Line’s tire bag has an adjustable shoulder strap for easy transport and a completely open top for easy access to your stuff. 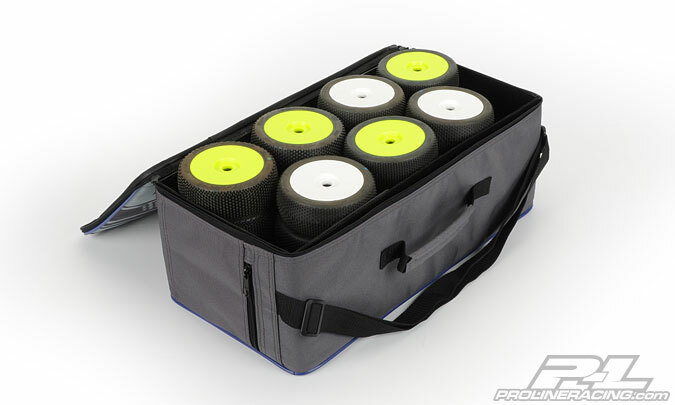 Pro-Line’s new tire bag is a must have addition to your race program – Order one today! This is a set of Pro-Line Tire Gluing Bands. We all know that tire gluing can be a pain but Pro-Line has just made life easier with our very own Tire Bands! These bands were specifically designed for holding tires down during the gluing process while still being stretchy enough to work on multiple sizes of tires. From 1:10 buggy and truck to SC and all the way up to 1:8 buggy, Pro-Line’s new tire bands perform flawlessly and look good while doing. The tire bands feature molded-in P-L logos and are made out of the same proprietary rubber as our tires. These new bands are the next must have item to add to your toolbox! Makes tire gluing a Snap! 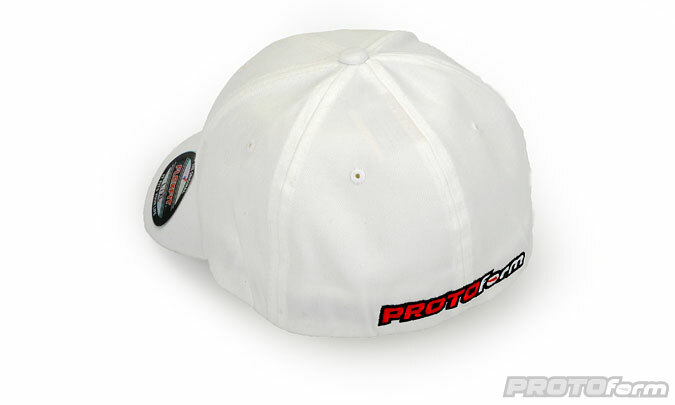 PROTOform is blending old school baseball cap styling with new school hat materials for a brand new black fitted hat. The full size PF logo front and center stands out among the crowd. The back of the hat has one large PROTOform logo. 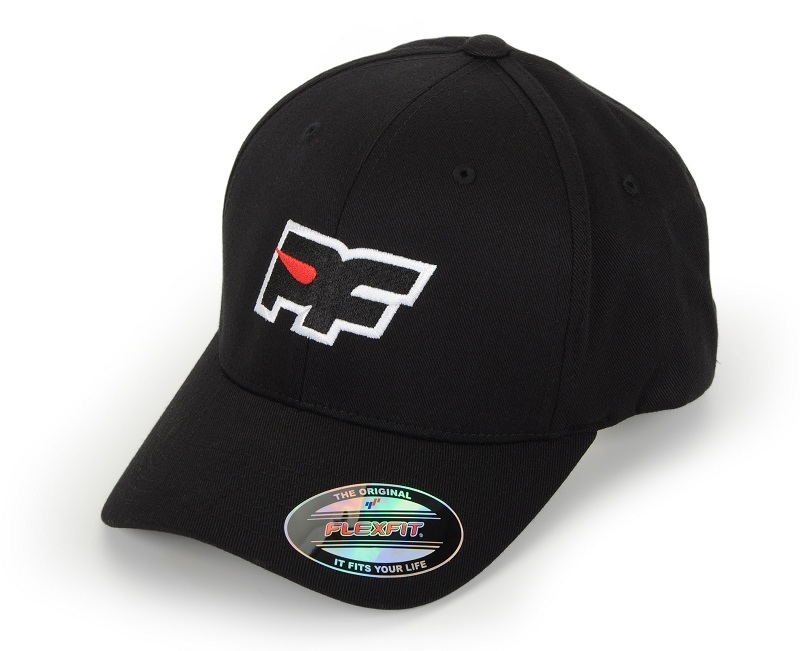 Features a Flexfit band and a curved bill that will fit your head perfect every time! 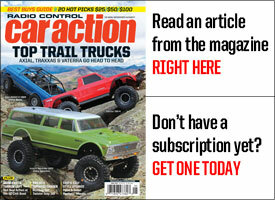 If you like this article, check out this additional article on Pro-Line.